Line mini muffin tin with paper liners. Preheat oven to 375 degrees. Mix together the flour, baking powder, baking soda, salt, cinnamon, and nutmeg. In a separate bowl, cream the butter with both sugars until fluffy. Add egg and mix well, then fold in the buttermilk. Stir in dry ingredients until barely mixed, then add apple chunks and cranberries. Divide the batter among prepared muffin cups (you’ll probably make two batches depending on the size of your pan, fill any unfilled cups with water.) 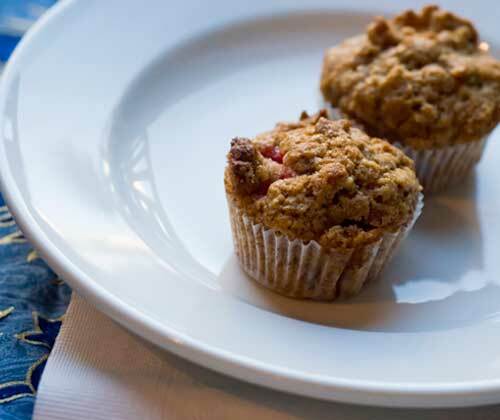 Bake muffins for 15 minutes and test with a toothpick—bake until the toothpick comes out clean. Remove from the oven and cool in the pan for 5 minutes before turning onto a rack. Recipe and photo courtesy of Pithy and Cleaver.